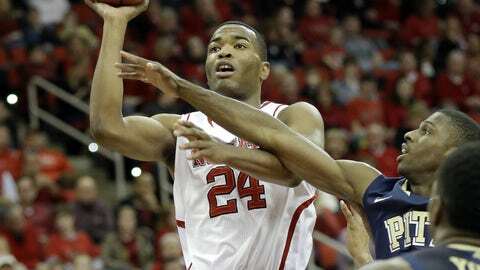 T.J. Warren scored 23 points but the Wolpack lost their ACC opener for the first time under coach Mark Gottfried. RALEIGH, N.C. — This young NC State (10-4, 0-1 ACC) team is going to have its ups and downs this year. Everyone knows that, even head coach Mark Gottfired. But he was as disappointed with his team’s second-half toughness as he has been after any game in his third year as NC State’s head coach. The Wolfpack lost a first-half lead and fell 74-62 to Pittsburgh (13-1, 1-0 ACC) in the Panthers’ first official ACC game. 1. That whole losing leads thing … yeah. NC State was up double digits in the second half on Missouri in a game they had to have last week, and this week, they were determined not to do that again. So the Wolfpack came out hot, playing good defense and dominating most of the first half, leading 34-26 at the break and 17-2 at one point. When leading scorer T.J. Warren looked up and saw that, he felt pretty good. "I’m thinking we had it," Warren said. "Put defensive pressure on them and just keep rebounding and just keep executing on offense. But then they started to come back and it put a lot of pressure on us." NC State took a 19-4 lead with 12:45 to go in the first half. And by that point, they had shot 8-of-14 from the floor and 2-of-3 from beyond the arc, with five assists to just one turnover. Pitt shot 2-of-11 in that span and didn’t make a three-pointer, and had turned it over twice. Well, that changed in a hurry. From that point on, Pitt outscored NC State 70-43. Pitt shot 24-of-43 from the floor while NC State shot 14-of-42 and turned it over 15 times. "We had a great start and did a lot of things well. We came out at halftime and had very little energy," Gottfried said. "Our young guys had better learn at this level that if you do that, you’re going to see the results like you saw today. It’s real simple to me. We’ve got to be a lot tougher than we were today." When asked what went wrong in the second half — NC State was outscored 48-28 in the second half, and a lot of that came early — Gottfried sighed. "Good question," he said. "I don’t know that I have the answer for that one. How does it happen? I don’t know. But I thought (Pitt) came out at the start of the second half, it was kind of like a prize fight. In a boxing match, if somebody knocks you a couple times and punches you a couple of times, you’d better make a decision whether or not you’re going to respond. And we did not respond today to their aggressiveness in the second half." Even in Pitt’s Big East days, it has always been a program known for its defensive prowess, its rebounding and its general toughness. Pitt certainly lived up to the billing in its ACC debut. But NC State, all year long, has been a team that can bounce back from adversity even within a game, and has — like their former head coach, Jim Valvano — never given up. The team didn’t actually give up, but their body language and general lack of fight seemed to indicate at least a surrender. That’s probably why Gottfried was so disappointed in the postgame. "How we responded today in the second half was the first time I’ve seen our group do that. We have not done that in any game, period," Gottfried said. "A couple opportunities where the ball was on the floor. They dove on the floor; we didn’t. A number of opportunities to get a defensive rebound — we didn’t. They beat us down the floor, got lay-ups. So some of that was our offense. "Some of that was just the whole approach in the second half. We have a team that for our first 13 games cheers for each other, great enthusiasm, great energy. We had great energy for the first 15-18 minutes of the game. We came out in the second half and we looked stunned. We looked around at each other, we were staring at one another and I didn’t see that same energy and enthusiasm in the second half that we’ve had this year." With a trip to Notre Dame looming, NC State knows it has no more margin for error. The Wolfpack has to win now if it wants any shot at making the NCAA Tournament. "Our mindset has to change," Warren said. "This is the most important time of the season, so we’ve got to come out more physical and more stronger than that." "We’ve got to look at our own selves in the mirror," Ralsotn Turner said. "Can’t really point any fingers. It’s really our fault. There’s nobody to blame. We’ve just got to be better." 3. NC State’s second-half defense was … porous. Pitt’s always going to be tough defensively, and NC State was struggling to get good looks when the Panthers switched to a zone and placed increased emphasis on shutting down Warren. But the NC State defensive effort has at least usually been there. It wasn’t in the second half of this game. Pitt scored 48 second-half points and shot 17-of-27 from the floor, scoring most of their 24 fastbreak points in the second half. The biggest problem was that their leading scorer Lamar Patterson, who had been pretty quiet most of the first half, was the beneficiary of some of those transition opportunities. He got into a rhythm. But the halfcourt defense just was not very good. Even when Pitt wasn’t getting easy looks in transition, it was getting into the paint at will, seemingly. Center Talib Zanna finished with 15 points, most in the second half, and Patterson either scored or passed to an open teammate. "We’ve got to guard screens better. When they come off a screen, we’ve got to be more aggressive coming off that screen and put a lot of pressure on them," Warren said. Turner said that NC State used its zone maybe four or five possessions, and it was even worse than the man-to-man defense. But for Warren and the rest of the team, it all really just comes down to toughness. If you’re tough enough to play good defense, you will. And until the Pack does that, it won’t win many more ACC games. "It all starts with us. It really starts on the defensive end — try to get stops, make it complicated for them, try to get defensive rebounds, securing the rebound, because that’s finishing the defensive play," Warren said. "We’ve just got to be better at that."